Today my son who is an incredibly fussy eater and hasn’t eaten a vegetable except for potato in potato chips in years had all of these vegetables. And not only did he enjoy them he promised to have them every single day. For some further context my son isn’t just normal scale of fussy. He doesn’t just protest, but if we don’t offer him anything else will eventually concede and eat when he’s hungry enough. I won’t go into too much detail, but trust me when I say getting vegetables in him without him literally vomiting them back up is a huge achievement. And the solution was so simple I regret not doing it soon enough. Actually the worst thing is I have actually tried this before. When he was little i used to toss frozen cubes of “baby food” I’d made up for his sister into fruit smoothies for him. I just didn’t think he’d fall for it anymore. And I know that it’s not entirely ideal. In a perfect world I’d be able to encourage my child to eat vegetables in vegetable form. But after all this time trying I think it’s time to go for super sneaky veggies. It isn’t so much a recipe as it is a concept. I chose carrots for their sweet but fairly bland flavour. Zucchini because they don’t taste like much and don’t think he’s ever eaten anything green. And beetroot mostly for the colour. Because he couldn’t suspect what was in it before he’d given it a good try. Basically I just chopped, up the vegetables and loaded them into a three tier steamer. 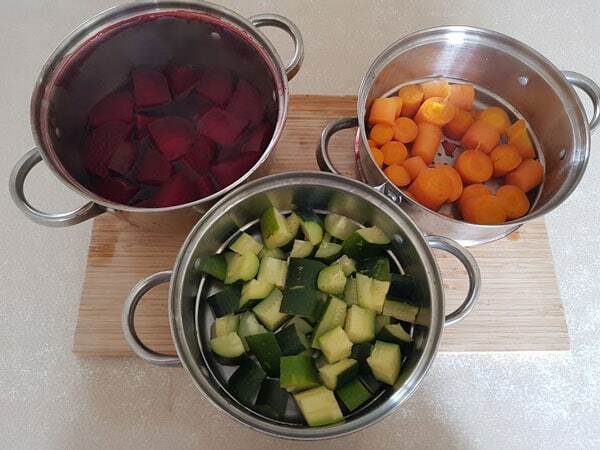 Zucchini at the top, carrots in the middle, and beetroot in the boiling water at the bottom. Once they were all super soft (about 10-15 minutes) I pureed them all together in a blender. 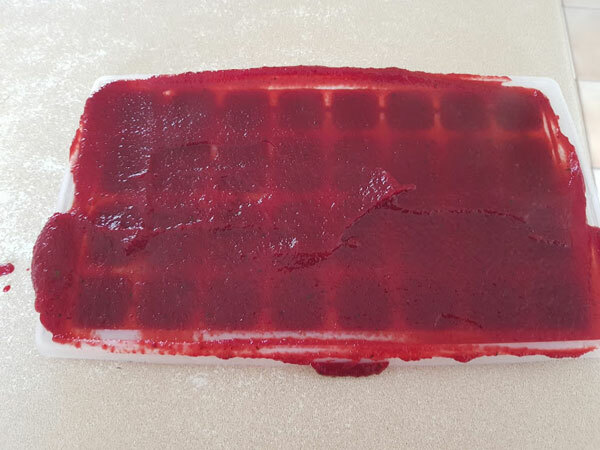 Gradually the deeply coloured water from the beetroot to get the right consistency. 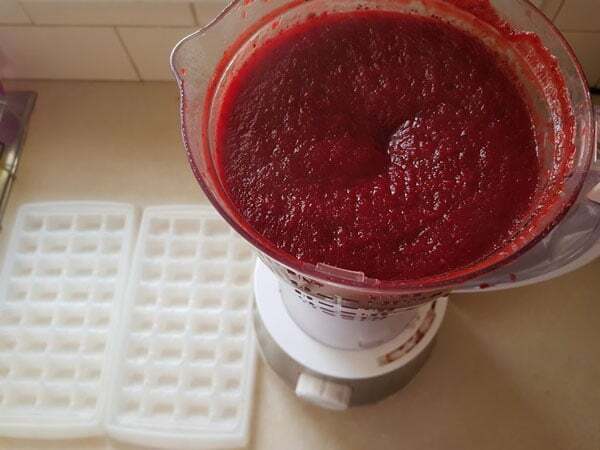 Then I poured the mixture into ice cube tray and popped them into the freeze. So now they’re ready on hand to just toss them into fruit smoothies. We usually have banana and berry smoothies so the colour didn’t give me away. Well the proof is in the fact that he’d drank it all down before I thought to take a picture of the actual smoothie! But I think we all know what a berry smoothie looks like! 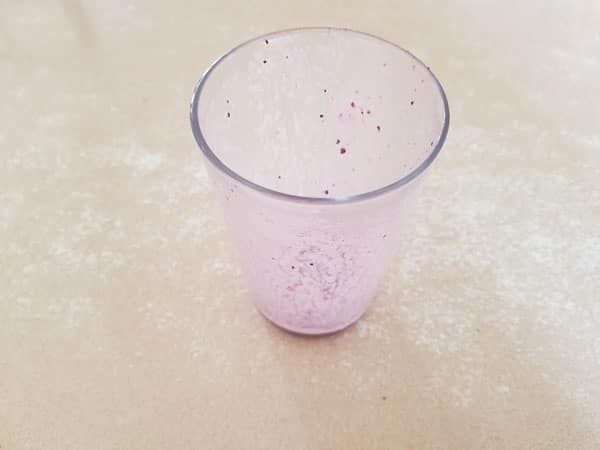 I told him I was making him a special smoothie and when he asked I said I wasn’t going to tell him what was in it until after he’d finished it. When he had drank it all I fessed up about the “secret ingredients. He wasn’t exactly impressed, but he couldn’t exactly claim he didn’t like it AFTER he’d drank it all! I made him a deal that if he has one of these smoothies every day we’ll give him a break about trying to get him to eat vegetables at dinner time. Once we’re done with this batch I’m going to think about what else I can sneak in undetected. But for now I cannot even describe how pleased I am with the outcome. It’s such a relief! And I’m more than a little smug about it. How the hell did you do that???!!!! Tu is much the same still. I was a bit surprised and relieved it went undetected in a fruit smoothie. He didn’t suspect a thing. ? My 3yo will drink juice which I make with oranges, celery and carrots. I also freeze them into ice blocks which he loves. Other than that he won’t eat any veggies. Occasionally I persuade him to put a bit of baked carrot in his mouth but it gets spat out. My nearly 2yo loves the ice blocks, loves baked carrot and potato but she won’t eat anything else. 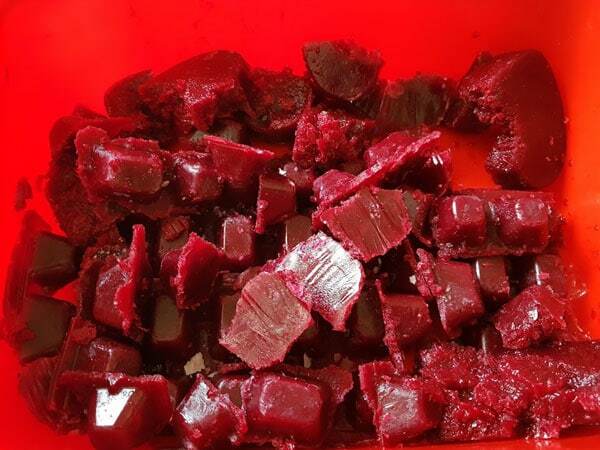 Yeah, I was worried I’d be pushing my luck – I actually hate beetroot. lol. 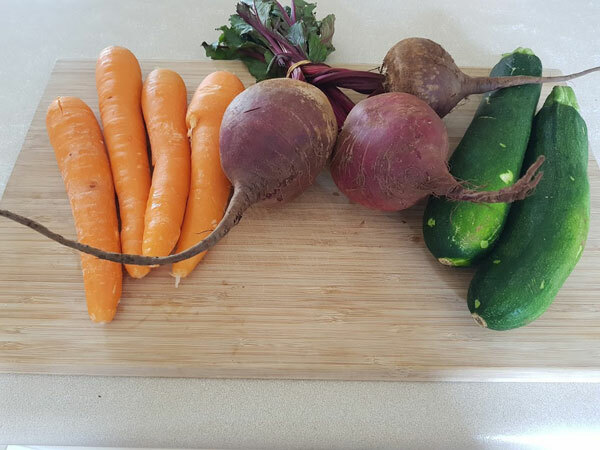 But I really wanted to cover the colour of mud that that zucchini and carrot mixed together would make. We’ve been super lucky with our 3 year old that he’s always been willing to try new foods and is pretty good with most veggies. But I was (and still am) a very fussy eater so I understand the struggle! Well done finding something that works! You should be very proud! I put very finely grated carrot, zucchini, onion, garlic and celery into rissoles, spag bol and lasagne. Has worked for years! I’m going to tell him ha ha …??? He already know so ? Keep it up… while the momentum is happening.. This is such a great idea! I used to make green smoothies all the time, but have gotten out of the habit. But, I never thought of adding veg this way. Bit genius there! Mine hates veges but also loves my soup – I think the vege goodness soak into the liquid right?? I’m a vego so love getting the kids eating them. I find if we mash it they love it! I’m a firm believer in you do what you gotta do, and if that’s smoothies or telling your kids they’re orange biscuits (which is really pumpkin cut in to a biscuit shape ?) and it works then that’s what you do! This is much more common than you think. I actually run Mealtime workshops for fussy/picky eaters & it’s great to see families see improvement in the kids eating….without having to hide anything!??? Yum!!! Well done! That’s a win. Last week I put a heap of pumpkin (the one thing my kids hate!) in a risotto and they ate the “orange risotto” ?? Well done!! That’s a huge win.